In China after a final rejection has been received, a request for re-examination has to be filed within 3 months. In China regardless of whether amendments are filed or not after a final rejection all cases will undergo interlocutory examination. After that there are three possible scenarios. (1) If the examiner thinks that the defects pointed out in the final rejection has been overcome during interlocutory examination, the final rejection will be directly revoked by the Patent Re-examination Board. And the application will be returned to the previous examining authority to continue the examination procedure. 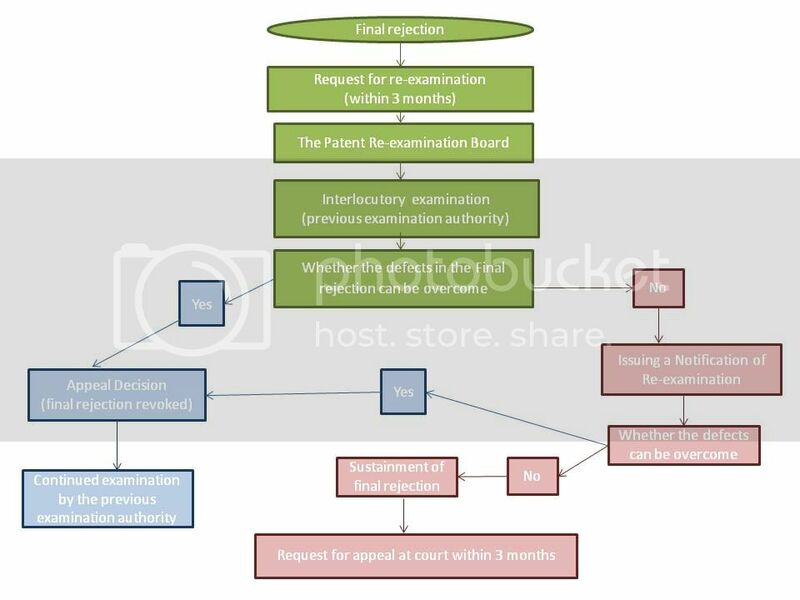 (2) If the examiner has negative opinions during interlocutory examination, the application will be examined by a panel of examiners of the Patent Re-examination Board. Next, a Notification of Re-examination will be issued. The petitioner must file a response within one month from the date of receipt of the notification. Under the condition that the response can overcome the defects pointed out, the final rejection will be revoked. Similarly, the application will be returned to the previous examining authority to continue the examination procedure. (3) If the panel of the examiners still thinks that the response cannot overcome the defects pointed out, a decision of re-examination will be issued to sustain the final rejection. The applicant can file an appeal at the intellectual property court within 3 months from the date of receipt of the decision of re-examination.